We could sleep late because our tour didn’t start until 10:00 am. The breakfast buffet in the hotel was one of the best of the tour. We got on the bus with a local tour guide. He was young and very good. We drove around for a while and then stopped near the Jewish Quarter. What was once a ghetto for Spanish Jews, who were forced out of Spain in the late 15th century in the wake of the Inquisition, is today Seville's most colorful district. 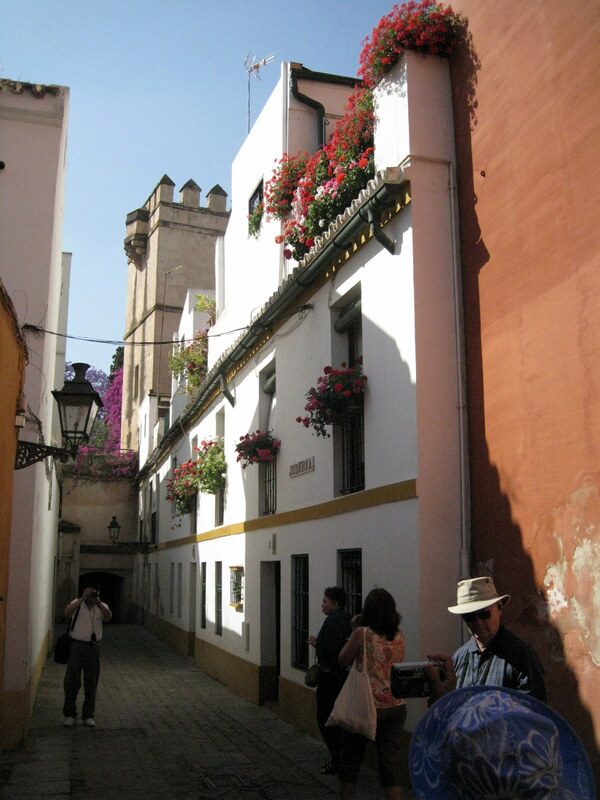 Near the old walls of the Alcázar, winding medieval streets open onto tiny plazas. Flower-filled balconies with draping bougainvillea and potted geraniums hang over this labyrinth of streets. We walked through it. It was very beautiful. There are a number of cafés in this area. We didn’t have time to take it all in. It would have been nice to have more time to look at the beautiful little houses and shops. At 11:00 we were able to go into the Cathedral. Depending on who is giving the information, this cathedral is either the largest or second largest in the world. We said at the Washington Cathedral that St. Peter’s, Rome was the largest and Seville was second and the Washington Cathedral the sixth. Some people don’t count St. Peter’s as a cathedral, which of course it isn’t. When Ferdinand III, re-established Christianity in Seville after conquering the city from the Almohades, founders of the fifth Moorish dynasty, on November 23, 1248, he did the same as he had done previously in Cordoba and in many other places: he converted the Moorish mosque into a cathedral. This mosque was much larger than Cordoba. 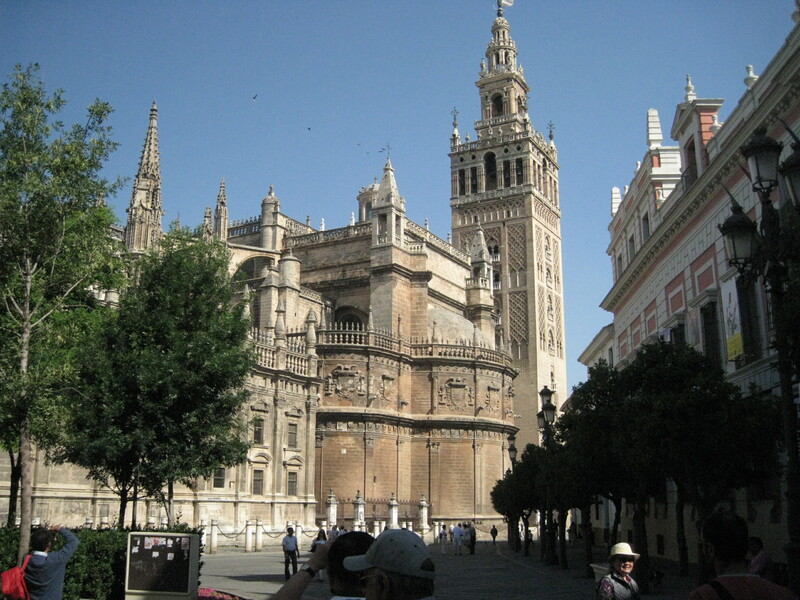 In this mosque/cathedral for a century and a half the Seville Church was returned to the times of the Visigoths. 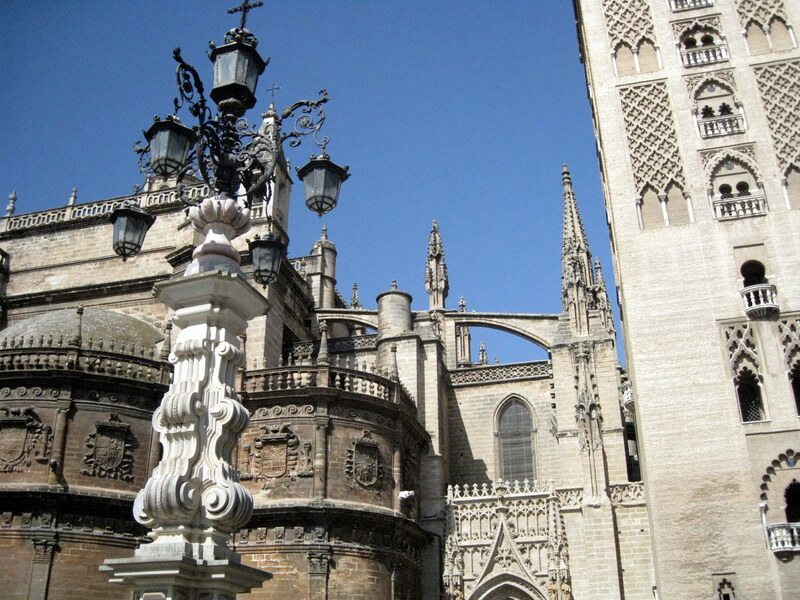 The mosque/cathedral was seriously damaged by an earthquake in 1356 and again in 1395. In 1401 the canons decided to build a new church –“that should be made such and so well that it should have not equals”. 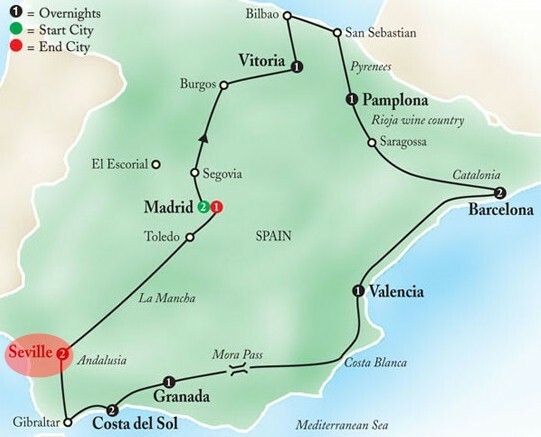 By the time of Ferdinand the influence of Gothic had reach Spain. The first stone is believed to have been laid in 1403. The church is 414 ft. long, 271 ft. wide and 100 ft. high. The central nave is 134 ft. long and the central dome reaches 143 ft. The nave and its four aisles are supported by 36 columns which support 68 vaults. The cathedral was not blessed and officially opened until May 11, 1507. 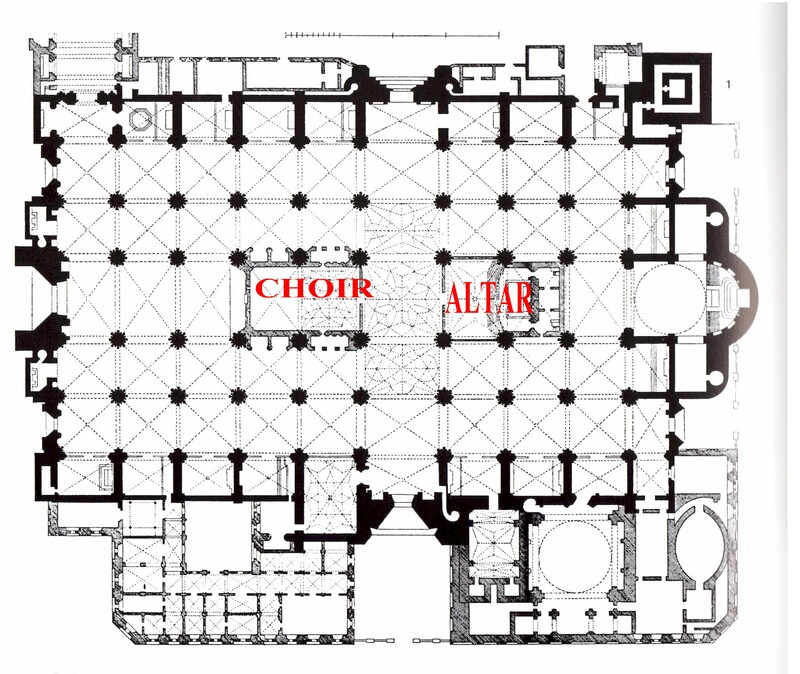 As we have seen in other cathedrals that is a choir in the middle with no open view of the high altar from the west door. There was some restoration-construction going on at the west end which eliminated some of the seating during this time. 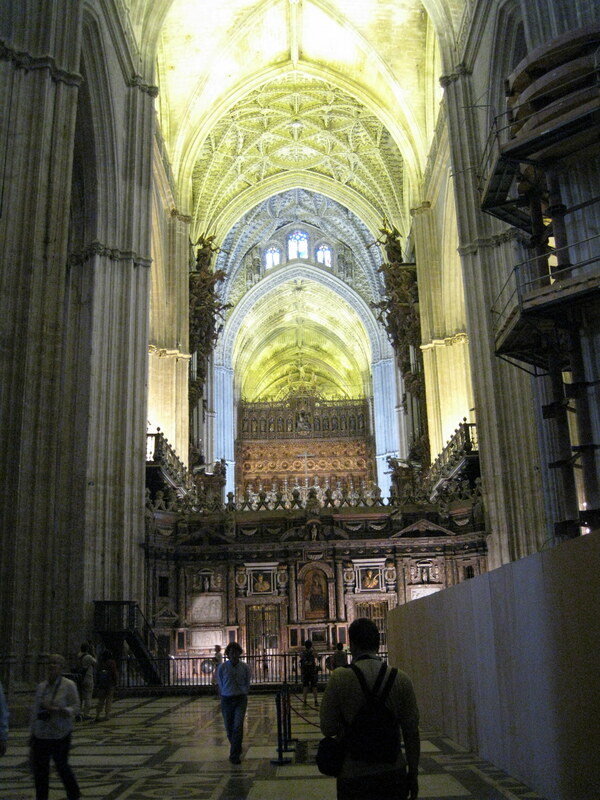 Because of the height of the nave, I was able to take photos of the entire nave, over the top of the choir area. Part of the top the Reredos of the main altar could be seen. 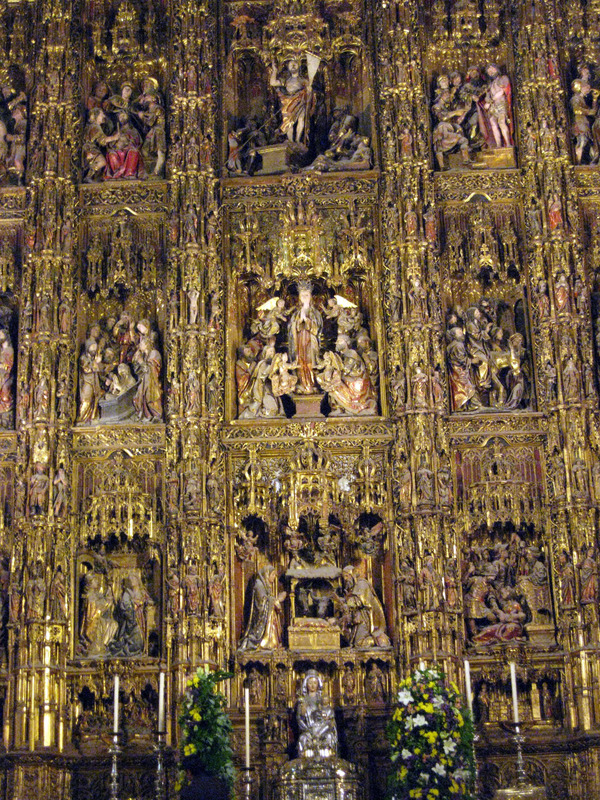 The altar piece over the high altar is the largest and certainly one of the most magnificent altar pieces that we have seen. It measures 65 ft high and 59 ft wide. It portrays the life of Christ in 28 niches, separated by a mesh of pilasters, ledges, daises between which are distributed 189 minor sculptures. During the construction work, a more modern altar had been put in the center of the south transept for larger congregations. The chairs could be turned from the high altar to face south. They could be extended northward towards the tomb of Christopher Columbus which occupied a large space in the center of the north transept. There is a lot of controversy about ALL of the remains of Columbus. His remains were deposited in this tomb in 1902. 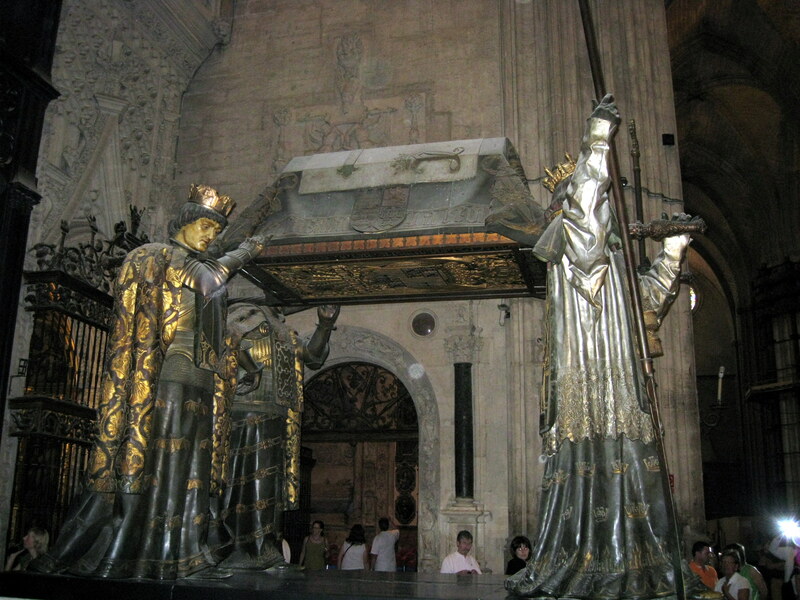 It is shown being carried by the kings of the four original regions of Spain: Castile, Leon, Aragon and Navarre. 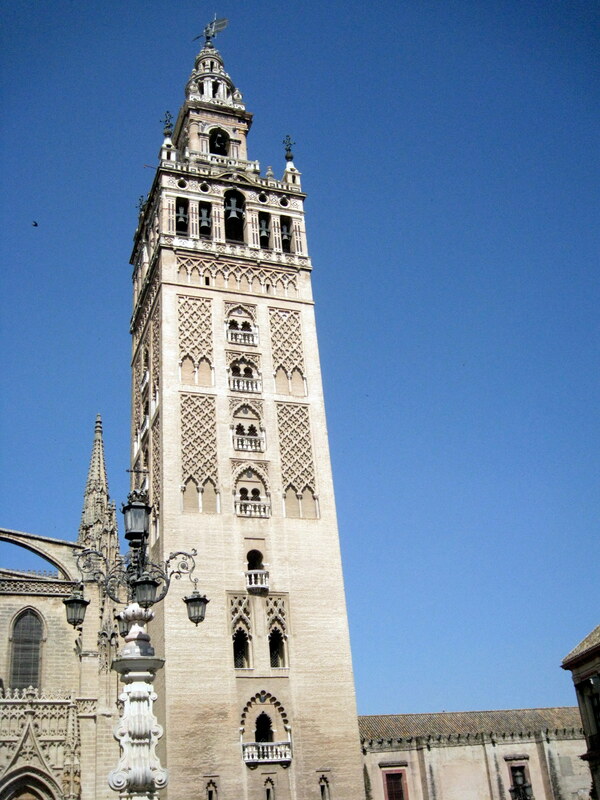 One enters the Giralda, the tower, from the inside of the Cathedral. This tower formed the minaret of the mosque which be gan to be built in 1184 and finished in 1198. It had been crowned by four large golden apples. These fell during the 1356 earthquake. The tower was then completed by a simple bell tower commissioned by King Pedro I. The present bell tower was commissioned in 1558 and took years to complete. At the top is a bronze stature of Faith which revolves acting as a weather vane. The inside consists of 35 ramps instead of steps. It is said this was done to make easy access to the top by riding horses and mules to the top. I walked up to the top…it was exhausting. The view was spectacular from the top. 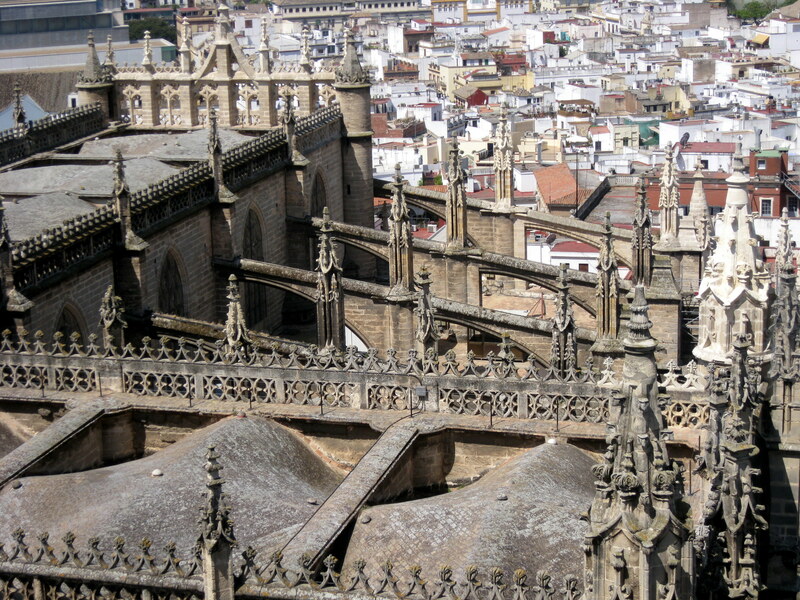 It was interesting to look down on the construction of the cathedral and the flying buttresses. We made a stop in the bookstore. 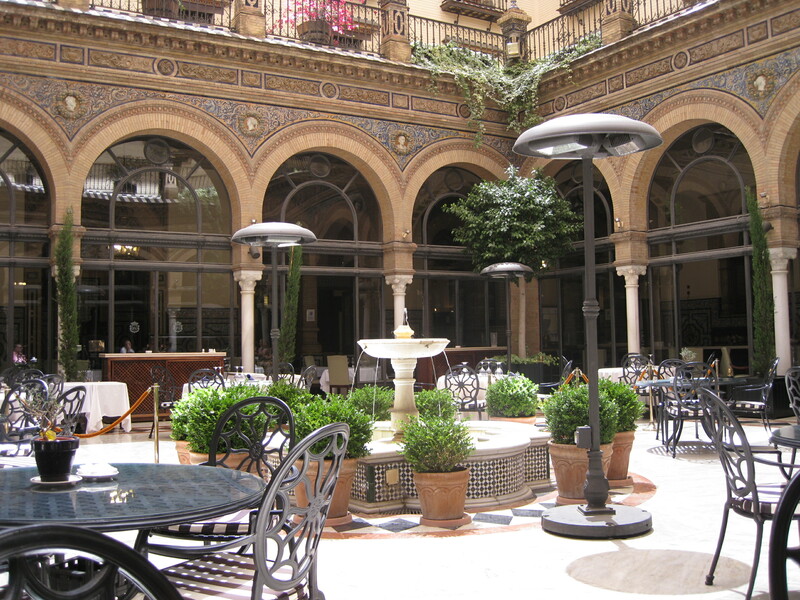 We walked down to the famous Alfonso XIII hotel where we had a snack lunch in the open courtyard. We had ham croquettes and small omelets. Our lunch was elegant, but we also saw that if we had chosen a three hour lunch, which is a traditional Spanish lunch, it would have been even more elegant. It was beginning to get rather hot as we walked back to the Alcazar for a tour. The Alcázar was originally a Moorish fort. 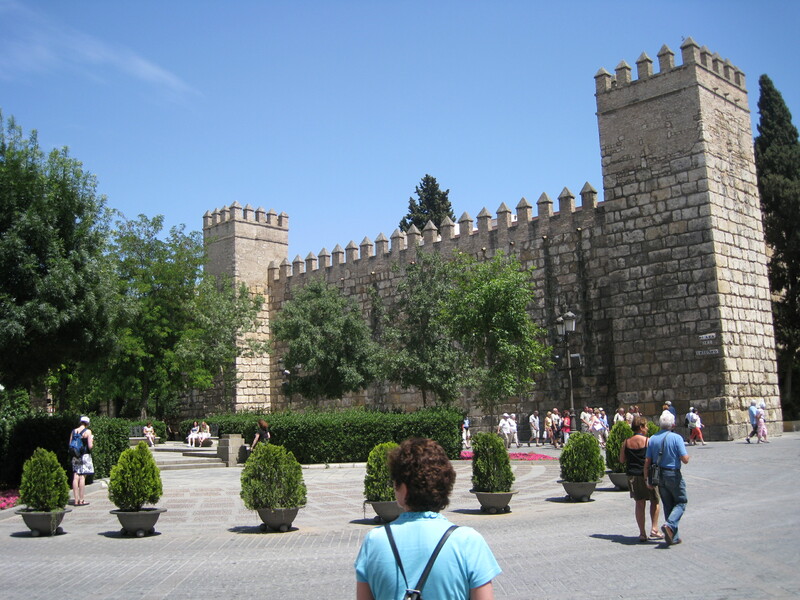 The Almohades , were the first to build a palace, which was called Al-Muwarak, on the site of the modern day Alcázar. 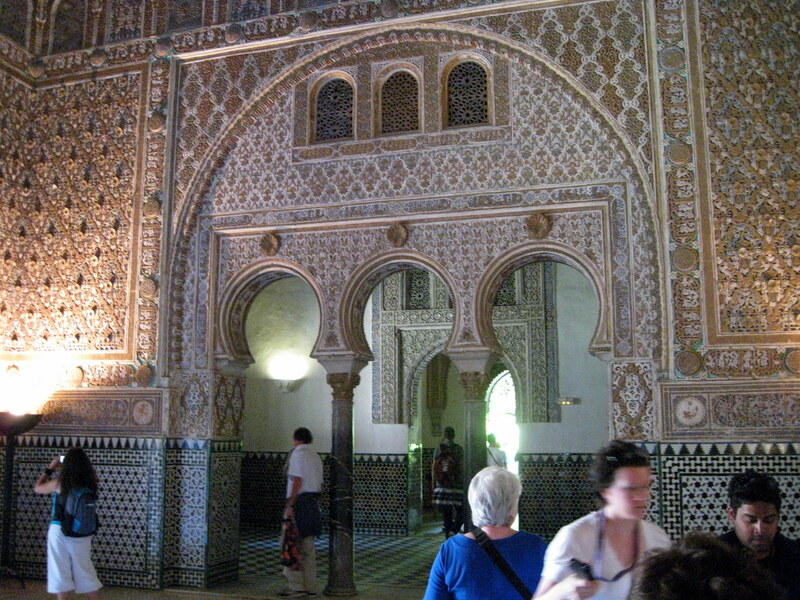 The palace is one of the best remaining examples of mudejar architecture. Subsequent monarchs have added their own additions to the Alcázar. 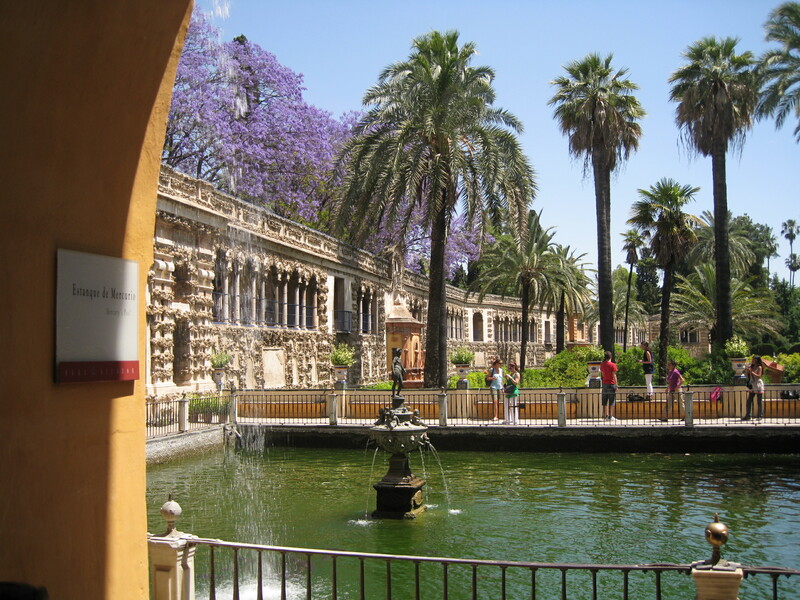 The upper levels of the Alcázar are still used by the royal family as the official Seville residence. It was beautiful place. We especially enjoyed the lovely gardens. It was getting close to 4:00 so we decided to take a taxi back to the hotel. My wife took a rest. Then we dressed for our Andalusian Night, dinner and flamenco show. 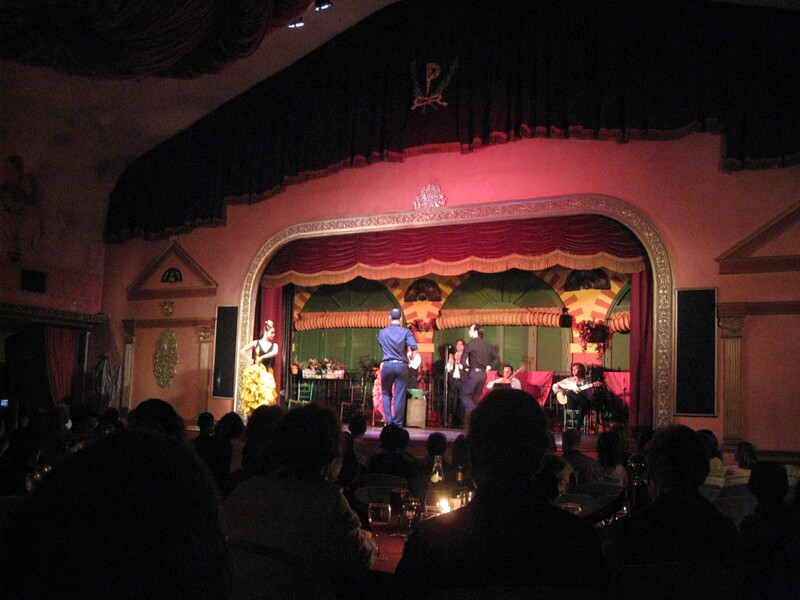 It was a typical dinner theater space…tables for dinner and chairs in the front for those who got drinks only. We had a good dinner with wine. The show was wonderful…good music and dancers. Everyone was in a festive mood. Some of our group had gotten dressed up. One woman wore a sari. We had a fun time!